It's a festive looking cereal. Green and red specks in the cereal pieces make it look like a limited-edition holiday cereal. I got a laugh from the marshmallows that are supposed to look like Fred Flinstone and Barney Rubble. My finger looks more like these characters than the marshmallows do. I was glad to see the Great Gazoo character on the box. For a Flinstones refresher, this was the prime-time cartoon's jump-the-shark character - a little green alien who would appear to Fred at inopportune times and fail to appear when our hero needed him most. His marshmallow looks like a candy Valentine heart that got wet. I'm sad to report that this is a very unnecessary cereal. It tastes fine - a sweet marshmallow taste just as the box promises. The problem is that its flavor is a carbon copy of several cereals already on the market... most notably Luck Charms. Sure, I know - half the cereals on the market are rip-offs of other cereals... so the relatively high rating I'm giving here is what I'd give Lucky Charms minus one egg for lack of originality. 1 gram of saturated fat per serving. 0 trans fats. 110 calories. A serving size is only 3/4 of a cup so double those numbers if you eat realistically. But good news for the weight-conscience fat-watchers: zero times zero equals zero. What do you think of Marshmallow Mania Pebbles? 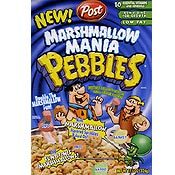 This cereal is back, it's now called Marshmallow pebbles but it is clearly on posts website as a new cereal just out. I am thrilled can't wait to see it on the shelves. This is my favorite cereal ever. Where to get this cereal at? This was delicious. I wish I could find it again. This is without a doubt the best cereal I have ever had... but I haven't had it in 2 years!! Where can I get it? 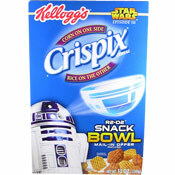 My kids and I LOVE this cereal... please let me know where I can still get this. I LOOK FOR THIS CEREAL EVERYWHERE... IT IS THE BEST CEREAL I HAVE EVER HAD!!!!!!! IS THERE ANYWHERE THEY ARE STILL SELLING IT THAT I COULD GET A LOT OF BOXES???? This cereal reminds me of a vanilla sprinkle cake with sprinkles mixed into the batter and frosting. Mmm. Slowing fading off the shelves in the stores near me... very sad. Personally, I think this is a pretty good cereal. Other than having miniature marshmallows, it really tastes nothing like Lucky Charms. However, I do prefer to eat it dry as a snack. It loses a lot of it's flavor and becomes rather mushy in milk. You don't know cereal, you (swear word)!